Blue Pearl was built with SSB in mind. Or… at least one of the previous 3 owners made a serious attempt to make her a stand-out in the SSB shout-out world. The radio - an Icom M600 - was grounded to the water tank with copper foil. The water tank was coupled electrically with the boat’s bonding system and connected via copper foil to the engine and then to the Icom AT 120 tuner. Along the way, the entire starboard locker was covered with copper mesh and that was integrated into the whole shebang. When we bought the boat it didn’t work worth a damn so we got an electrician on board - who was also a amateur radio operator - to try to make it work, and he gave up. Said the radio was a piece of junk. So we bought a used Icom 710 which came with an AT 130 tuner and stuffed the whole thing in. The same ham/electrician helped us install it and pronounced it operational… although I wasn’t all that convinced. Certainly you could hear stuff but we weren’t sure about our ability to get our signal out there. We’ve used it over the past 6 years but our ability to communicate clearly with folks off in the distance has been a challenge. More often than not, we need a relay to talk to someone way out in SSB-land. Over the years we have fought with corrosion. The copper foil disintegrates and needs to be replaced regularly. It runs through our bilge and the marine environment just eats up the copper. All of the experts have provided us with encouragement and advice. We added a foil connection from the tuner to the rudder post for another connection to the salt water. We have replaced the copper foil, added DC (direct current) blocks to discourage DC transfer along the foil but allow radio frequency… but we are always the weakest signal on all the maritime nets. There is a simplistic alternative - the KISS-SSB counterpoise. Instead of all the copper foil with DC blocks and connections to the boat’s bonding system, you just connect a wire to your antenna tuner and lay out this 10 foot assembly (like a garden hose) down in the underpants of the boat. The experts who have worked with me view it as snake oil and a rip-off for dumbasses like me. They can’t hide their contempt. All of the folks I’ve met who actually have it installed swear by it. But as far as boat stuff costs, this is relatively inexpensive - only $150. So we are giving it a go after Christmas. Cover your ears, I expect to be the loudest voice on the Coconut Telegraph. Or not… and then back to the drawing board. KISS counterpoise is genius! Works like a hot damn and doesn't involve connecting all kinds of crap all kinds of places. I'm chatting with folks in Tierra del Feugo like they were in the next room. OK, that's a bit of an exaggeration but I'm certainly getting out there way better than before with all the copper. Time to start ripping it all out and cleaning up the copper rust mess! If we were more ambitious we might have headed further south before coming back to Antigua to fly home for Christmas. Or even stayed in Guadeloupe longer to explore more. Or headed north to Barbuda or St. Maartin. However, we have a lot of teak on our boat and it needed attention. We spent a ton of dough a couple of years ago to have it done by a professional. We can’t afford to keep paying that kind of money but the alternative is to let the teak go grey… but it looks sooo good when it is kept up. So we need to do our own work and put on a couple of “service coats” every year. Or maybe even twice a season. Some of the teak was in rough shape so we had to scrape it right down to the wood. In other places we did some patch-work. It isn’t perfect but it looks good and the wood is protected. So that’s what we’ve been doing. In the morning, after some serious catching up on the news, reading emails from kids, doing the Sudoku and having a leisurely breakfast we build up the energy to sand down the finish. Even though it looks perfectly fine, you need to scuff up the varnish from the day before so the new coat has a good “grip” and any imperfections are knocked down. We usually wait until it is really hot so we are bitchy and uncomfortable when that job is done. Looking in Pam's picture window. Beer and a hot dog (or a salami sandwich or sards on crackers) and then a serious nap during the REALLY hot part of the day. Then Pam (I’m not qualified) gets on her painting gear. I mix up the varnish with some thinner - too much and it splashes all over, too little and it drys with an “orange peel” look. Then PammyAngelo bums her way around the boat, applying the perfect coat. Repeat 2 times for the undamaged parts - 7 times for the parts that we scraped down to nothing. Have a cooling dip in our backyard pool and then a great supper, some mindless TV, read and go to bed. So that's been our week. Almost done. Time to think about a visit home! We left you in Montserrat where we looked Soufriere in the face and survived. It really wasn't that dramatic! The sail to Deshaies was nice, great angle on the wind and good speed. Quite dramatic seeing the old Montserrat airport complete burned out from the '97 eruptions. It is all covered in ash... but you can kind of make out structures that survived. Caught dinner... some kind of fish.. not really sure what. We've been through Deshaies a number of times but only as a point of transit... check-in to France going south to Dominica or check-out going north to Antigua. So this time was different. We aren't really going anywhere right now so we decided to make Deshaies our destination and explore. They have nice, free mooring buoys in Deshaies, and during the season they are mostly full of local fishing boats, dive boats, tour boats... but this time we got one! Woooo hooooo! Our neighbour - how to get back to Italy? Turn right after Bermuda? Hmmm, this dock doesn't have a deck. Pam has talked a number of times about going to the Botanical Gardens but I've always been a stick-in-the-mud about it. So this time we decided to go. It was only 1.4 km so we decided to walk. So, this was 1.4 km of pure hell. Straight up, 35 Celsius. About 10 switchbacks to allow cars (probably airconditioned) to make it up this formidable incline. When we got there we were completely spent... red-faced, puffing and ready for a rest. So we sat on a bench and fed the ravenous koi while we caught our breath. The garden is amazing and really well done. Worth a visit - even with the heart-stopping climb. Apparently they will pick you up from the bottom of the hill but that would be for sissies. Now Mike, that's a lot of Koi! Ooooooh my Precious, you've got some syrup for me? In 1997, with our whole family, we chartered a boat out of Point a Pitre and sailed around the area... Les Saintes, Dominica, Marie Gallant and various places on Guadeloupe including Deshaies. So we've been there before. Point a Pitre is quite a way from Deshaies but we thought it would be cool to go back to where we chartered way back then. So we took the bus from Deshaies into Point a Pitre - 4 euro each way. We got there to find a busy city... not really great for exploring in 35 C temperatures, so after walking about for an hour, we ate a Botik (pita pocket?) from a local vendor and climbed back on the bus. After 6 days away from our great spot in Five Islands Bay near Jolly Harbour, Antigua we decided it was time to come "home." Had a great sail (about 6.5 knots all the way) and caught two small mahi. So we are good for fish tacos until our next fishing adventure. I used my fish-cleaning skills honed at BIMPYs on the Sunshine Coast of British Columbia. Settling in to do more boat chores. Some of the teak, mostly on the starboard side, didn't fare well over the summer so we are doing damage control on the varnish. Montserrat or Where you gonna go when the volcano blow? Beautiful sail over to Montserrat! Six knots or more the whole way, calm seas... and Pam snagged a whale just as we got to the point. Must have been a whale. It ran out almost all of our line and I kept tightening the tension to try to slow it down. At the end it spit the hook somehow. We ended up with the lure still attached. Must be a Mahi or Wahoo or something down there with a sore lip. Pam says she's going after it again tomorrow. Wow... our own personal welcome! It was calm when we anchored and we had paid attention to the weather in order to avoid the bad swell that this anchorage is known for. Going to be a smooth night! Smart! Hah!! We woke up after an hour or so rolling back and forth violently. It's horrible and hard as hell to sleep. You have to sleep on your back so your elbows keep you from rolling off the berth. Not a great night. Met up with Joe Phillip for a great tour of the island. Joe is in his mid-sixties and has lived here all his life... so he's seen Hurricane Hugo in '89, Soufriere eruptions of '95, '97, '06, '07, '08 and 2010. He was evacuated from his home on a Friday to return on a Monday in 1997... but Monday never came. He and his family lived in a classroom in a school in the north of the island for more than 2 years. He showed us his where his house had been... and many others. In Joe's case, the homes deteriorated from abandonment (he wasn't allowed back) and the jungle reclaiming the land... not like the town of Plymouth which was overwhelmed by a huge pyroclastic flow which burned and buried huge parts of the town. Still other areas in Montserrat were buried under rivers of mud and sand leaving the original roads and houses under 30 feet of mud and sand. Rains have washed away most of the dirt leaving sand - which has become the island's greatest export. Thirty feet of sand covering the old golf course. Wonder if they've found any golf balls? Joe took us to Montserrat Volcano Observatory - where international geologists monitor the activity of Soufriere. There is no reason to believe that it is done spewing out gas and ash. We saw a terrific documentary showing the devastation of Plymouth... literally getting burned - then buried as the debris pushed into the sea, extending the area of Montserrat several square miles. Things left on Friday... we'll be back Monday!!! What's cool about Joe - besides his intimate knowledge of his island - is that he has a million photos on his iPad. He can take you to a place and show you how it looked before the devastation. Looking across the Montserrat Springs pool to the devastation of Plymouth. George Martin (Beatles fame) created a recording studio here back in the 70s and all kinds of important bands have recorded here. Jimmy Buffet, Sting, the Police, etc. We watched a short video of George Martin surveying the studio after Hurricane Hugo hit in '89. It was destroyed and he was very emotional. His legacy to the island is the Cultural Centre... a really cool facility for concerts, town hall meetings, weddings, funerals, church services... anything else you can think of. He organized a charity event at Royal Albert Hall in London, featuring Jimmy Buffet, Mark Knoffler, Paul McCartney, Sting, Phil Collins, Ray Cooper, Midge Ure, Arrow, Elton John, Eric Clapton to raise funds for the island. Setting up for an event in the Auditorium - about 400 theatre style seats behind us. Joe loves his island. He is a great ambassador, gifted researcher and wonderful story teller. We've been wanting to come here for years and are feeling terrific that we have been to see the island with our newest charming friend. So... long blog. Sorry. 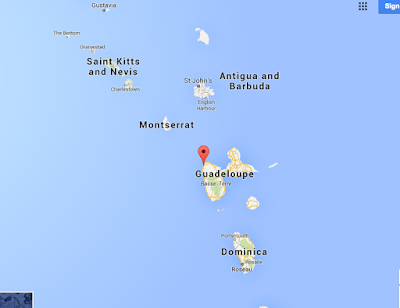 Off to Guadeloupe tomorrow. Hope tonight isn't as rolly. We have been staying at the beautiful Hermitage Bay Resort near Jolly Harbour waiting for a weather window to head the 25 miles over to Montserrat. The harbour at Montserrat can be nasty rolly so we want to go at a time when it is pleasant. And by "at the resort" I mean anchored out using their blazingly fast internet and enjoying the view. No way we could afford to stay in a place like that. We had one of those awkward moments when we decided to treat ourselves at the local Crows Nest restaurant in the marina at Jolly Harbour. Normally we would go to a roadside food stand and get lunch and a beer for $10 (Canadian.) We sat down, ordered beers and then looked at the menu. HUGE (Trump-like) prices. So chalk that one up to experience. Too embarrassing to leave so we sucked it up and had $20 hamburgers with $8 beers. Yummmm. Lots of boats in the boatyard. Not too many folks down here, yet. Pam has just about finished washing and waxing the entire boat with a toothbrush so it is gleaming and when it rains the water beads all over. Looks really cool! We've been keeping cool in the water and exploring a bit with Murphy the Dinghy when we are not doing boat chores. So we are checked out of Antigua and ready to head to Montserrat. Went into Jolly Harbour today to have the birthday lunch Pam promised me from "Lindas" in the boatyard. We checked out, bought gas for Murphy the Dinghy and headed to the Epicurian for last minute groceries and gallons of wine. Met Mike and Judy from Discovery. Alright, Faithful Reader. Talk to you from Montserrat... or where every we find our next internet.